The impact of social media has become undeniable in the social realms of society and increasingly is being seen as a corporate resource and not just the domain of the marketing and communications team. Facebook, Twitter, Instagram, and now more increasingly - LinkedIn, are all becoming staple checks when recruiting sales staff. A candidate can look great on paper, but social media gives insight into their genuine personality and behaviour outside of formal realms. It's cost-free and can help you tell if a candidate is a good cultural fit - so here's how to do it right. Shortlist candidates from CV's & cover letters first! There is no point wasting time looking at the social media profiles of someone who doesn't have the necessary experience and qualifications for your business. Once shortlisting is done, social media comes into it's own - it can be a huge help in deciding tough picks, letting you see who better fits your company as a person. Shortlisting can be incredibly time-consuming, and ultimately the short-list is all that matters - you can make better use of your time using a recruiter to shortlist for you - letting you pick from the best selection of applicants. LinkedIn isn't new, it's been a titan of networking for quite a while now. But, where it's really made waves the last year or so is recruitment; the advent of LinkedIn Jobs in 2014 changed recruitment. Now not only could you network yourself to potential employees, and vice versa, but jobs could be posted, suggested, and applied for through LinkedIn's Website and App. As a social network it overcomes the issue of social media not listing relevant history and experience - so why use anything else? Because LinkedIn profiles are public, outward-facing - candidates seeking new roles will list all their skills and attributes, from all industries - you won't get the specialized address a CV or cover letter would have. LinkedIn is a fantastic way to attract talent, and to build contacts - but when recruiting it serves best as a booster - strengthening recruitment, rather than replacing it. Head here for our guide on how to use LinkedIn effectively. You should seek professional legal advice immediately whether or not this is part of your formal recruitment process. As with all aspects of the law if you play by the rules your company can avoid being tarnished with the highly undesirable 'discriminating' brush. 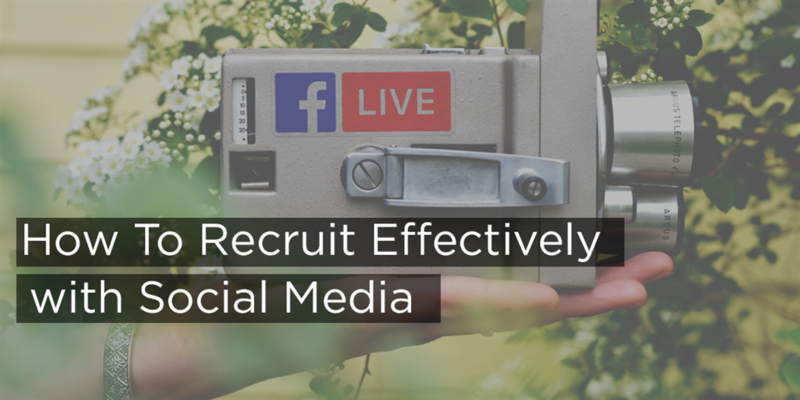 Even if you don't intend to use social media to recruit it is still worth checking what records you may need to keep to prove you didn't use social media to recruit. Do you really need to screen candidates using social media? What does Facebook or other social sites add to your selection process? Your integrity as a business rests on what you do when people aren't looking so just because it's free and convenient, don't assume that it is a necessity to use it. Keep records of how you found the candidates and anything that supports that fact that your hiring decisions were fair and based upon consistent, objective and job-relevant searches. You must also bear in mind that social media information can often only be available for a short period of time, so do not rely on finding supporting evidence of your hiring decision too far in the future. Social media can be a double-edged blade.a candidate can present a fantastic portrait of themselves online only for them to turn up on day one and be the complete opposite of expectations. Similarly, a candidate may look like they go out too much, or have non-compatible interests on LinkedIn or Facebook - and you pass them up, when their professional actions might be truly impressive. Recruiting through, or using, social media needs to be done in a way that fits your business' interests - ensure they have the skills, and won't negatively impact your brand in their behaviour online. Keep recruiting reigned in; it can be tempting to go out and search for new professionals on social media - but leave it to the experts, don't have people outside of your HR department, or recruitment, searching for candidates. If everyone starts searching it can become addicting, and also overflow you with heaps of unqualified candidates. Leave it to the pros - like us, and here's why Aaron Wallis are the best recruiters for you. Are all parties involved in the recruitment process aware of your policy on social media screening? If not you could find yourself clashes with opinions on 'social media recruitment' within your team or with outside bodies...ensure there is congruency within your team and they know what your company's stance is on it. Be up front and honest with your candidates. Consider informing the candidate of your intentions to check out their profile. Should you discover anything about them that would (according to you) make them unsuitable for the position this will give them the opportunity to despute the information and provide their perspective. Use all of your resources! Yes whilst Facebook is free, easy and convenient it shouldn't be your sole method of recruiting for positions. Facebook does not always provide an accurate picture of a candidate or a balanced cross section of the population. Combining your recruiting efforts on Facebook (if you must use it) with the more traditional channels provide a much better solution to finding that perfect candidate and give a more balanced cross section. Doing this will also then be viewed as fair. Social media is now crossing over into different sections of businesses and it is important that employees are clear on the most appropriate ways to use these channels in the content of their work. Learned social network behaviours are likely to be inappropriate for the workplace and it is your responsibility as the Managing Director, HR Manager or the hiring manager etc to establish clear policies for your team and promote them as necessary. These policies need to be clear and actionable to avoid any misunderstandings or grey areas. Follow these tips and you should be fine, but remember social media is an end of cycle process - let a recruiter do the shortlisting for you, and go from there. If you're looking to hire new sales professionals check out our recruitment page.